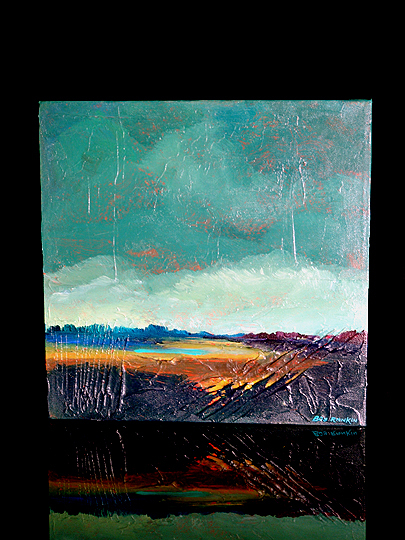 ACRYLIC ON CANVAS, 12" BY 12"
Bob Rankin is always experimenting with style... although this work reminds me somewhat of some of his other landscapes, it has a darker quality to it than the others. Not only is the sky dark, as if a storm is coming, but the landscape itself is also dark, punctuated by only a few bright sparks of light. I especially like the bright spot near the bottom of the painting... it makes me wonder if a lone ray of light has managed to pierce the clouds, or if the ground itself is on fire. This work is quite heavily textured, with ridges of paint chopping the ground. I love the atmospheric quality of this work. It's quite a contrast to Bob's other works.